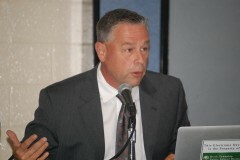 Members of the Brick Township Board of Education are set to vote on what is likely a contract extension for Interim Superintendent Richard Caldes at a meeting scheduled for Thursday night. Caldes’ contract currently runs through Dec. 31. Legally, the district must have a superintendent named at all times, which would require the current board to extend a contract past Dec. 31 despite a new board majority taking office after the new year. The terms of the contract have not been released publicly. Due to five members of the current board having conflicts of interest in the matter, the Doctrine of Necessity must be invoked by the board before voting. The doctrine allows the entire board, including conflicted members, to vote on matters of necessity for the district, but precludes the conflicted members from being able to review the contract beforehand. In previous cases where the doctrine has been invoked in Brick, the terms of contracts have not been released publicly before meetings and conflicted board members were given a brief, five minute-long time period to review contracts before voting. Caldes is currently serving as interim superintendent while criminal charges pend against Superintendent Walter Uszenski, who is accused of providing educational services to his grandchild to which he was not entitled. Besides Caldes, former superintendent Walter Hrycenko, former assistant superintendent Patricia Lorusso, Business Administrator James Edwards and Brick Township High School principal Dennis Filippone hold certifications necessary to serve as chief school administrator. A new board could, potentially, appoint another interim superintendent from within the district or outside of the district if they choose, though it could potentially be complicated by Caldes’ contract. Legal action is still pending from the 2008 ouster of another interim superintendent, Melindo A. Persi, who was suddenly replaced when a new board majority took office. Though various state officials have found that former board member Daniel Woska acted improperly in the way Persi was ousted, the case is still being appealed more than seven years later by Woska, who is being represented by former board attorney Nicholas Montenegro. Persi is also pursuing a civil action against the district, alleging the new board – none of the members of which still serve – refused to pay him money he was owed, stemming from a 30 day termination clause in the contract. The meeting takes place at 7 p.m. at the Brick Township High School auditorium.